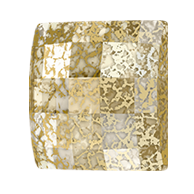 The 2493 Swarovski Hot Fix Chessboard Square Flatback Rhinestone is a square stone with a flat back and a curved crystal top with chessboard faceting. The chessboard faceting allows for a modern and mosaic like appearance. 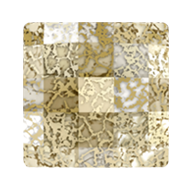 These 10mm Crystal Gold Patina Chessboard Square Flatbacks are available here in a full factory package of 1 gross (144 pieces). Swarovski 2493 Hot Fix Square Chessboard Flatbacks are made of "Advanced Crystal" and are lead free and compliant with international standards.